This is my adaptation of Hugh Fearnley-Whittingstall's courgette polpette. I cut the oil to cut the points but just can't bring myself ever to only use half of the ball of mozzarella, so the original recipe is only one pp extra. 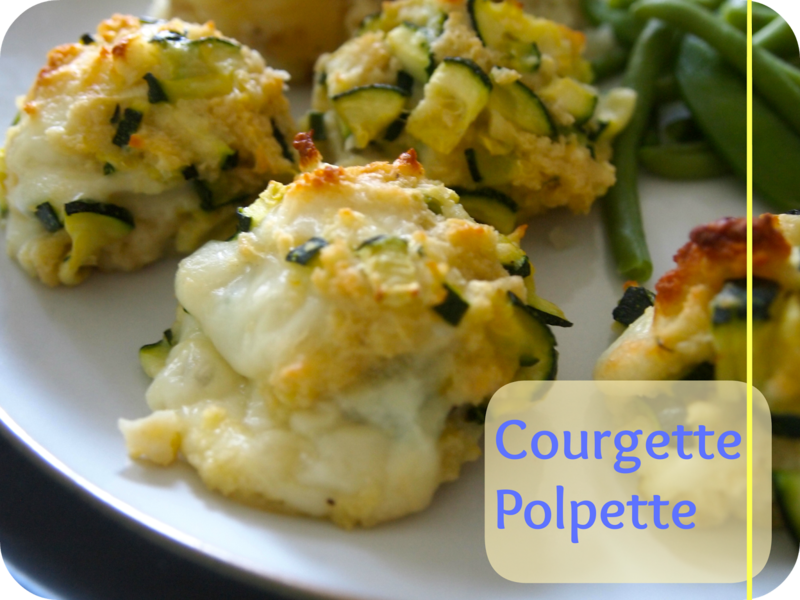 I didn't have three courgettes, so this made slightly less than I would have liked but made for more cheesy polpette. D, bizarrely, had a meltdown about the fact that he couldn't see the 'kangarilla' any more. It took me a good ten minutes to work out that what he meant was mozzarella. He eventually calmed down enough to eat these and they were mostly eaten all up - courgette and all. Result! Three servings (four polpette each) 6 propoints. Original recipe (if using light mozzarella) 7 propoints. Preheat oven to Gas Mark 7 and line your baking tray with baking paper. Gently fry the courgette and garlic in a pan for ten minutes. Mix all ingredients together in a bowl and form into handsized balls. Put onto a baking tray and into oven. Cook for fifteen minutes - the polpette should be golden at the end of the process. I served with 200g of smashed new potatoes, 5g of butter, green beans and sugar snap peas. If you've got the courgette bug, why not try Mama Ghannouj, Sweetcorn and Courgette Fritters or even Courgette, Pea and Spinach soup? Also I guest-posted on Where Are My Knees? this week, giving more recipes for zero point icecream. The post can be found here. If there are any other versions of this you've tried, pop over and share them. Want to keep up to date with all my posts? I can now be found on Facebook, Instagram, Twitter, Bloglovin and Pinterest. Follow me!